The Dandi March saw a few Gandhi lookalikes. Gopal Rao is a theatre personality who has portrayed the Mahatma in plays in his native Andhra Pradesh. During the march, villagers came up to him and garlanded him with khadi garlands. Some touched his feet and sought his blessings. The Mahatma disapproved of garlands made of flowers, preferring garlands made up of khadi cotton. Every historical moment is invariably captured by one outstanding image that symbolises it for posterity. For the Dandi March, it was the amazing picture of a little boy pulling the Mahatma by his stick on the beach. 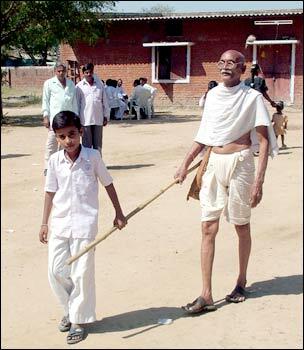 A little village boy and Gandhi lookalike Gopal Rao tried to recreate that image at Bareja.